What difference has the Christian Faith made to the world in which we live? For many believers, the answer would be something along the lines of it has changed countless lives and helped relieve much suffering. Cynics and atheists might claim that, like any religion, it has caused many wars and brought about its own share of suffering. The answers to the cynical arguments are readily available in volumes on world history from the perspective of Christian apologetics. What The Book That made Your World does is entirely different. 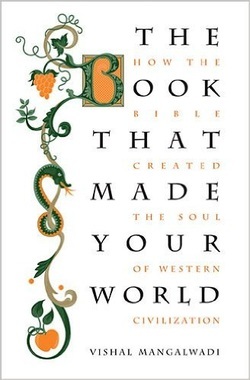 Rather than make the usual points that a religion cannot be confused with the actions of those who falsely claim to follow it, this book shows that the Bible has not only made a difference in our world, but also has essentially made our world the way it is in almost all of its positive aspects. Although a few years old now, this book by Indian scholar Vishal Mangalwadi is a must read if you are interested in seeing just how the Bible has influenced Western civilization. Using his native India as a point of contrast, Mangalwadi shows what societies are like when the influence of the Bible has not been present or has been removed. He successfully demonstrates that the educational, scientific, technological, military, economic and cultural successes of the West came in large part from the fact that it was a civilization based on biblical principles of thought and approach. For example, the author shows that humanism was originally a product not of the rejection of the Bible, but of scholars who accepted and followed the Bible’s approach to knowledge and thought. The 400 pages of documentation and argumentation that Mangalwadi assembles are substantial. By the time the reader reaches the final chapters, there is little room for denial that without the Judeo-Christian worldview built on the foundation of the Hebrew and Christian Scriptures, there would essentially be no Western civilization as we know it. Further, he shows that it is precisely that worldview that has created so many of the aspects of Western society – ranging from the freedom enjoyed by women to the establishment of healthcare and the respect for life itself that we so often take for granted. Other authors have made the essential point of this book in the past, and others will doubtless continue to do so, but The Book that Made Your World will remain different in terms of the sheer weight of evidence it provides and the intellectual skill with which it is presented. Although the Bible itself is seldom quoted in the book, its arguments are anchored in an unfailing understanding of biblical teachings, and Mangalwadi does a better job than anyone this reviewer has ever read in demonstrating that the Bible unquestionably influenced and transformed the individuals who, throughout history, have transformed entire nations. The Book that Made Your World is based on a great amount of scholarship, but it is also rich with personal anecdote and experience. Mangalwadi incorporates fascinating and eye-opening experiences from his relief work in India and from his travels around the world. Although it is not a “light read” by any stretch of the imagination, it is a clearly and accessibly written book and an immensely illuminating one. It is a book that the late Chuck Colson called a “must-read.” If you read it, you will probably never see the world in which you live in the same way again.